Chor der Deutschen Oper Berlin, Orchester der Deutschen Oper Berlin / Andrew Litton. Stage director – Marco Arturo Marelli. Following last night’s Elektra tonight we got to see a rarity. Indeed, other than a concert performance in Frankfurt and tonight’s performance, one of a run of three, Operabase lists no other current productions of Die ägyptische Helena anywhere in the world in the last two years. The piece does contain some magnificent music, the opening Act 2 aria ‘zweite Brautnacht’ is a favourite party piece of many sopranos, and the finales of each act soar in that inimitable Straussian manner. Yet there seem to be a number of moments where the inspiration flags and the work really needs a conductor willing to push the music along. Perhaps with this in mind, Marco Arturo Marelli’s staging was somewhat busy. The set consisted of three separate spaces, the lobby of a grand hotel where Aithra reigns, a lurid boudoir and the boudoir devoid of colour and populated at times with corpses. The revolving platform fluently switched between these scenes as the evening developed and flexible panels also allowed individual characters to cross between domains. As Helena and Menelaus enter, they are introduced as quite frumpy travellers but gradually Helena is transformed with a wig and a dress into the most beautiful lady in the world that she is meant to be. It was sensitively lit and as a piece of storytelling it did the job. Marelli solved the issue of personifying the alles-wissende Muschel by making her a fortune teller who told the future through watching a portable television set. There was a fair bit of gratuitous plate smashing, not unexpected given the Hellenic origins of the plot perhaps. What I found it didn’t do was offer any profound psychological insights nor did it succumb to the temptation to play the work for camp which would certainly have been one way of doing it. Premiered in 2009, it’s a good-looking show and was clearly revived with great respect for the original regie. Following her truly outstanding Senta in Hamburg in February, I was eager to hear Ricarda Merbeth take on the challenging role of Helena. As I mentioned last time her soprano is exceptionally well placed which meant that the high declamatory writing of the part came as second nature to her. Her ‘zweite Brautnacht’ really was glorious, the voice seemingly without limits, soaring higher and higher with the utmost security and sung with generosity and abandon. Yet she never sounds forced, the voice comes out freely and easily. Perhaps it could be said that she lacks a little resonance at the bottom but she more than makes up for it at the top. Laura Aikin gave us an impeccable account of Aithra, a role that seems to combine a turbo-charged Zerbinetta and a lyric soprano capable of singing Sophie. Aikin most definitely has the voice for it. Her diction was excellent and she made much of the words. Her voice is absolutely even through the range, from the bright top through to the silky middle, hers is an extremely glamorous sound. She is also an astounding actress mapping the journey from vivaciousness to seriousness effortlessly. I don’t know what Strauss had against tenors but the role of Menelas, like many of his other tenor roles, is cruelly written. It requires a lot of heft at the top and also an ability to sustain a punishingly high tessitura. Tonight, Stefan Vinke gave us a highly capable assumption of the role. He sang all the notes, they were usually hit head on, and coped heroically with the extremely cruel writing. The voice has a slight bleat at the bottom but he has staying power to share and in this role that really is what one needs. 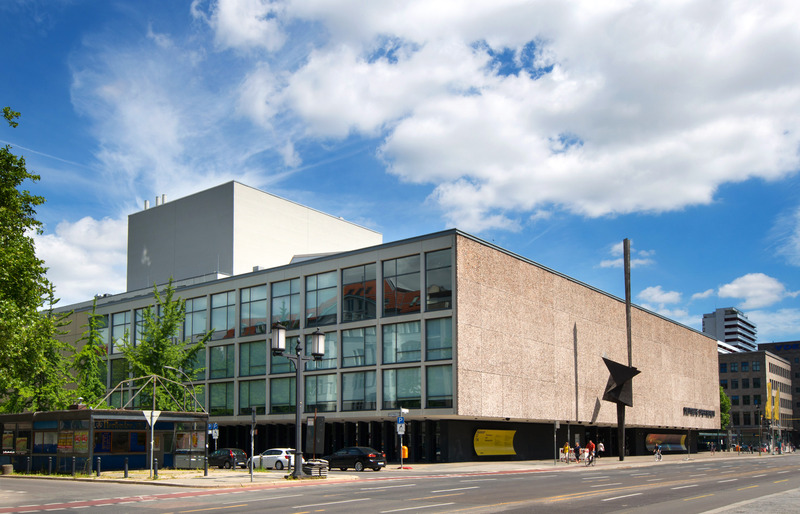 As always, the remaining roles were cast at the very high level that the Deutsche Oper consistently offers. Derek Welton sang Altair in a focused and rounded baritone that carried well. Likewise, Andrew Dickinson’s Da-Ud was sung in a very attractive lyric tenor. Ronnita Miller gave us a fabulous alles-wissende Muschel. She was absolutely magnetic dressed in fortune teller chic, commanding the stage even when she wasn’t singing. When she did sing, she sang her lines in her marvellously rich contralto, the sound a beguiling combination of red wine and the finest chocolate. She is without doubt a singer to watch. The duos and trios were nicely tuned and mellifluously blended. The same could be said for the interjections of the off-stage chorus produced with good blend and tuning, clearly testament to the high standards instilled by William Spaulding who will soon be leaving the Deutsche Oper for London, England and the Royal Opera Chorus. The orchestra, as they did last night, gave us phenomenally good playing. Every section sounded absolutely superb, playing with delicacy and rising to some magnificent brass-led climaxes. Indeed, I don’t think I heard a single split note all night and some extremely momentary sour intonation in the strings passed very quickly. Andrew Litton’s conducting I felt dwelt somewhat on the languor which sadly felt that in some places, such as the initial duet between Helena and Menelas, that there was a tendency to drag. Despite this, there was real delicacy and warmth in the string tone that made it all seem even more attractive. The big finish at the end of Act 2 really did ring out splendidly. Straussians must certainly be grateful to the Deutsche Oper for giving us the opportunity to see a stage performance of this fascinating if uneven work, especially one at the high level we had tonight. It was superbly sung by Merbeth, Aikin and Miller, and Vinke’s performance inspired admiration for this unwavering stamina and willingness to give it everything. The staging was serviceable and provided some logical storytelling if lacking in the ultimate degree of psychological insight. I’m certainly glad to have had the opportunity to see it.